Born in Shreveport and raised on a farm outside of town, Young, as a teenager, was more interested in pop music than country. But that changed when his high school football coach, who moonlighted in a country band, started Young singing at the local Optimist Club and nursing homes. 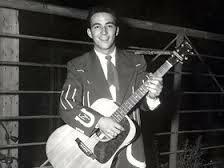 Young then met Webb Pierce and began working with Pierce in clubs and on KWKH. By 1951, Young was appearing on the radio station’s feature program, the Louisiana Hayride. 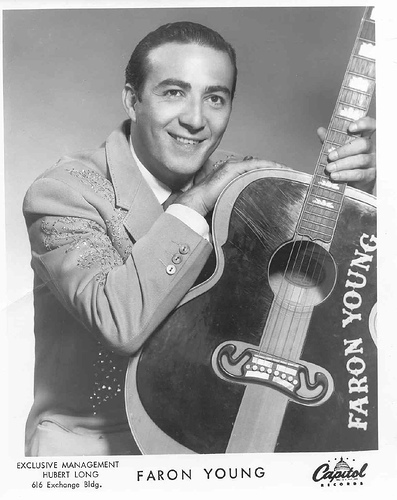 From the early 1950s through the mid-1970s, Faron Young was among the top stars and most colorful personalities in all of country music. Signature hits like “If You Ain’t Lovin’ (You Ain’t Livin’)” and “Live Fast, Love Hard, Die Young” marked him as a honky-tonk man in both sound and personal style, while other chart-topping singles like “Hello Walls” and “It’s Four in the Morning” showed off his versatility as a vocalist. A music industry entrepreneur, he invested in Music Row real estate, and in the 1960s he published the influential trade paper Music City News. Though his career did not lack for controversy, Young’s voluble, outgoing personality was well received, and the entire community was as shocked as it was saddened when he died of a self-inflicted gunshot wound at the age of sixty-four.